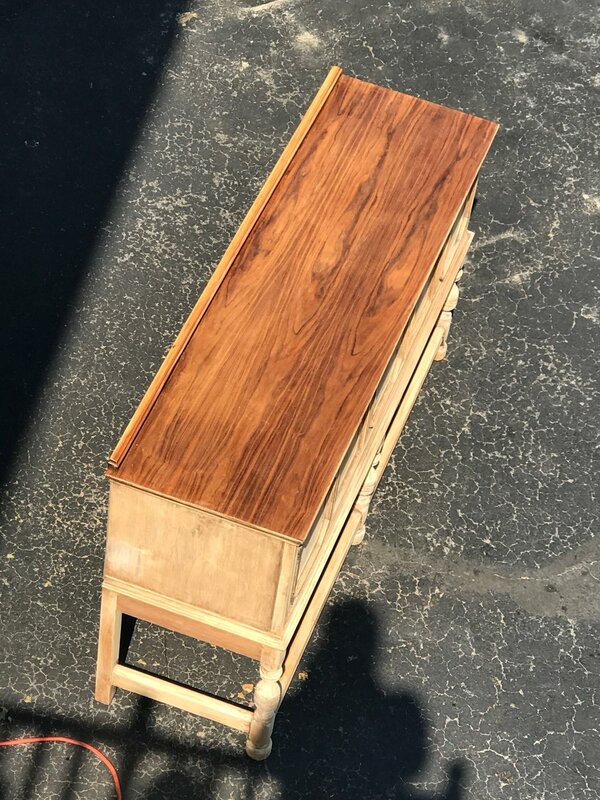 Although we were set on going to Bouckville to see if we could find a piece, my mom ended up finding this buffet on Facebook for maybe $50? We knew we likely wouldn't find anything this cheap somewhere else, so we decided to go for it. If it didn't work, as least we hadn't made a huge financial investment. 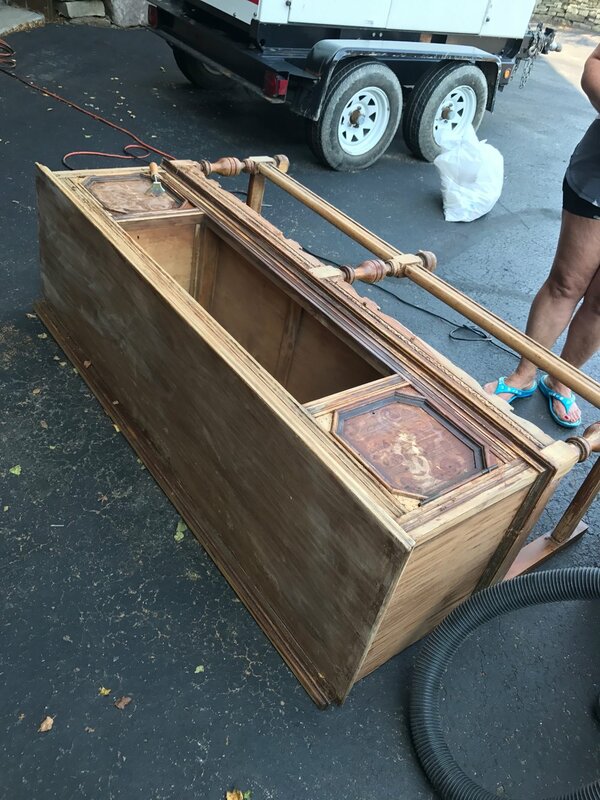 My mom picked the piece up and stored it in her garage until we both had a free weekend to tackle this project. **DEFINITELY do this. You will want to do this project outside for sure. Scroll down to the bottom for tools used. 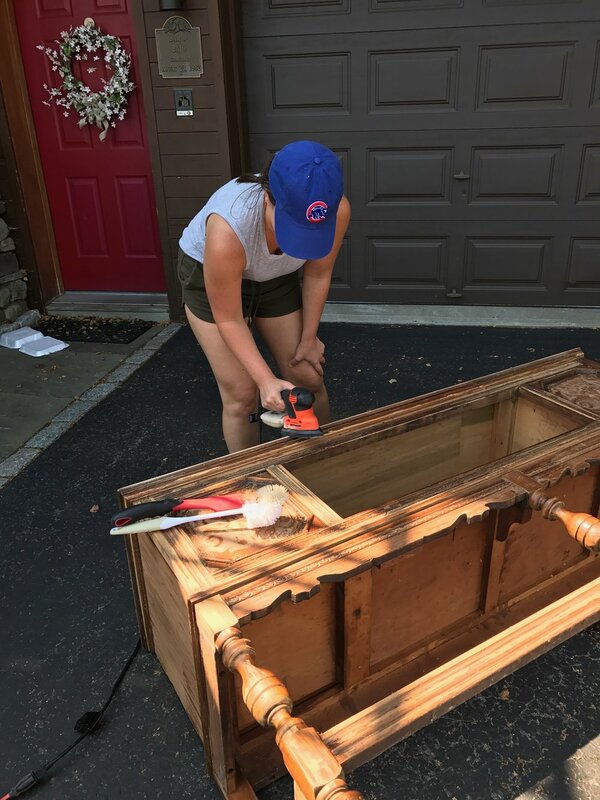 The only prep work we really did was removing the hardware and drawer from the buffet. We kept the doors on and worked on them attached to the buffet. When you are doing this project, definitely wear gloves. The epoxy is insane, if even a splatter gets on your skin it will burn. Gloves are a necessity! The epoxy says it should sit on for 15 minutes before you begin your work, but because it was a beautiful sunny day, it pretty much started working right away. We poured the epoxy into old mason jars and applied pretty generously with a brush. We worked in sections, my mom on one part and I on another. We only applied epoxy where we were working because it does dry pretty quick. You could see a major difference with even the first of the paint scraper, which was so encouraging. We had NO idea what the wood would look like underneath, but we fell in love pretty quickly. It got VERY tricky down at the bottom because where was so much detailing around the leg. We used wire brushes and did the best we could working through the fine grooves. You do basically keep repeating the same steps, but I don't want to mislead you, I would say this project took us 10-15 hours to complete. But once we saw the end in sight, we had so much motivation to keep going! Here is our before and after!! I was seriously so in love with it! Now here is where our story takes a turn for the worst. I LOVED the natural look of this wood and 100% wished I could have kept it this way. As I mentioned above, we refinished this buffet for my bridal shower. We were planning (and did end up doing this) to use it as the bar at the shower and I ultimately was planning to use this in my bathroom, so it needed to be sealed. We did a ton of research and found that a water based seal would be the way to go as it would not (or should not) alter the color of the wood. However, after trying 3 different water based matte seals, they all pulled SUPER red. After 2 failed attempts and having to re-epoxy and scrape it off (this is why you test in small areas), I just had to go with the third one, although in all honesty, they all looked exactly the same. Buffet used as the bar in the background of this photo! Ultimately, this is what we ended up with. After doing some measuring, I decided this piece was too big to use in the bathroom - so now I'm on the hunt for a new piece, but a little smaller, haha! So I was able to apply more epoxy and attempt to remove the seal. The wood does still have some red undertones to it, but I'm really happy with how it came out. We have moved this piece into our basement (currently under remodel) and can't wait for the space to be done so that this piece can really shine. I'm so grateful my mom and I tackled this project together - and I truly hope I am able to pass this piece on to my kids someday.